1896. 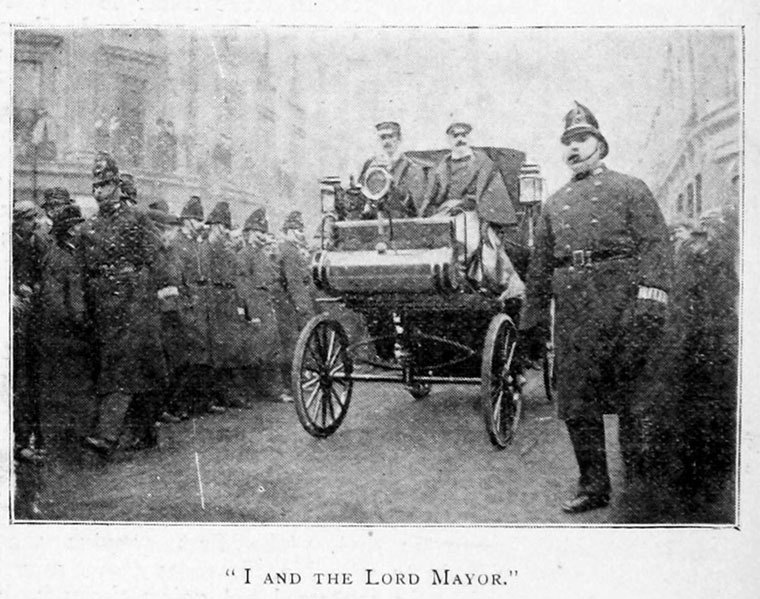 Harry Lawson and the Lord Mayor at the 1896 London-Brighton Run. Henry John Lawson (1852–1925), keen cyclist, bicycle designer and company promoter, was an early enthusiast for the motorcar and bought up many patents in an attempt to control the industry. He launched the first major show in May 1896 and also used his influence to help remove the 4 mph speed limit. He was a small man, just five feet tall, and reputedly died almost penniless after spending two spells in prison. He claimed to have been almost killed on the 'Sussex'. 1852 February 23rd. He was born at 1 Nevill's Court in the City of London, the eldest son of Thomas Lawson, brass turner and Calvinistic Methodist minister, and his wife, Ann Lucy Kent, who were married 15th November 1849 at Newington. They had two sons and two daughters and HJL was the eldest. 1870s Lawson designed several types of bicycle in the 1870s. His efforts were described as the "first authentic design of safety bicycle employing chain-drive to the rear wheel which was actually made", and he has been ranked alongside John Kemp Starley as an inventor of the modern bicycle. 1876 Haynes and Jefferis made a few 'low' bicycles to the patented design of James Likeman and Lawson . 1879 January 25th. He married at the Providence Chapel, Brighton, Elizabeth (Lizzie) (b. 1850), daughter of George Olliver, carpenter. They had two daughters and two sons. He moved to Coventry where he was involved with Haynes and Jefferis and merged it with the Tangent and Coventry Tricycle Co of which he became manager. He sold his Brighton business to W. H. Halliwell, a gentleman who was afterwards very well known in trade and political circles in Coventry. It was not till many years later (1895) that Lawson was publicly acclaimed as the inventor of the rear-driven "safety" bicycle. 1880 When the Tangent Cycle Company joined with Dan Rudge to become the Rudge Cycle Co he became sales superintendent. 1880 Birth of his daughter Elizabeth Anne who married Charles Wilson Harris, an egg and butter merchant. 1881 HJL was living at 860 Warwick Road, Coventry age 28 and was a bicycle salesman. Also in the house were his wife Elizabeth (age 31) and Elizabeth A. (age 1) plus one servant (age 14). His father (a Calvinistic minister), mother and sister Martha A. were living at 109 Ditchling Rise, Preston, Brighton. His brother Thomas Lawson was living in Strood, Kent as an Accountant and Independent Minister with his wife Rebekah and her mother Amy Sandland. 1882 Birth of his son Thomas Ebenezer Lawson who became a medical practitioner. 1882 Birth of his daughter Marie Rhoda who married Herbert Harris, an egg and butter merchant. 1887 He was Superintendent of the Sales Department of the Rudge Cycle Co when it was made into a joint stock company. 1892 May. President of Watford Cycling Club. 1895 As one of many attempts to promote his schemes and lobby Parliament for the elimination of the Red Flag Act, Lawson and Frederick Simms founded the Motor Car Club of Britain. 1896 June. Launched the New Beeston Cycle Co; the first works to be taken over would be Quinton Cycle Co. In a P.S. to the announcement, Harry Lawson said this was the last Cycle Co that he intended to be connected with. 1896 March. He set up the Daimler motor company with Gottlieb Daimler and Frederick Lanchester having purchased the rights from Frederick Simms. Was chairman. .
1896 June. Court action against him to recover damages of 7,750 pounds. In 1892 he was a director of the Licences Insurance Corporation and Guarantee Fund and had made certain verbal promises but these were not in writing so action dismissed. 1896 November 14th. Lawson and the Motor Car Club organised the first London to Brighton run, the "Emancipation Run", which was held to celebrate the relaxation of the Red Flag Act, which eased the way for the start of the development of the British motor industry. Lawson attempted to monopolise the British automobile industry through the acquisition of foreign patents. He acquired exclusive British rights to manufacture the De Dion-Bouton and Bollée vehicles; bought the Humber Bicycle Co; and British patent rights for US bicycle designs. He founded a succession of promotional companies including: the British Motor Syndicate (which was the first of many of his schemes to collapse in 1897), followed by the British Motor Co, British Motor Traction Co, Great Horseless Carriage Co, Motor Manufacturing Co (MMC), and he bought in the rights of Gottlieb Daimler, and of Edward Joel Pennington, forming the Anglo-American Rapid Vehicle Co.
1897 Criticism of a patent of Lawson's that had just been published, that it was of little inventiveness, something that could have been achieved by a competent mechanic . 1899 Fronted the Anglo-American Rapid Vehicle Co in New York. 1900 Newspaper suggestion that if Lawson's involvement in the British Electric Street Tramways Company had been known, the subscription for shares would have been even poorer than was the case, because of the recent experience with British Motor Co, Great Horseless Carriage Co, London Steam Omnibus Co. Many of Lawson's patents were not as defining as he had hoped, and from 1901 a series of legal cases saw the value in his holdings eroded. Lawson's patent rights were subsequently eroded through successful lawsuits by the Automobile Mutual Protection Association. 1905 December 16th. Released after serving nine months in gaol, having spent most of the time in the infirmary and written a book on his experiences. 1911 Living at 11 Ornan Road, Hampstead: Henry John Lawson (age 59 born City of London), Electrical Engineer and Employer. With his wife (married 32 years with six children of five are living) Elizabeth Lawson (age 61 born Brighton) and their son Reginald W. Lawson (age 20 born Watford), a Stockbroker's Clerk. Also his sister-in-law Sarah Cleary (age 56 born Brighton), a Widow and his nephew Victor E. Robinson (age 13 born Brighton). Two servants. 1915 HJL with John Henry Swinburn and C. W. Langford were fined for irregularities in the shares of the Bleriot Manufacturing Aircraft Co, the English branch of Louis Blériot's aircraft company. Lawson secretly acquired control of the company just before a public subscription to help expand its war effort, but soon found itself in breach of its contract with Blériot; when this came to light the company was wound up and its director found guilty of fraud and dishonesty. 1918 July. 'Henry John Lawson, aged 65, Golders Green, was charged at Bow-street, London, to-day, "that he, between 1 March and August, 1914, unlawfully conspired with Stuart Alfred Curzon to cheat and defraud such members of the public as should be induced to subscribe for shares in a company called the General Omnibus Supply Manufacturing Company, Ltd.' He claims he was almost 'very severely wounded in the 'Sussex' and was given out as killed' and has since been treated for four months. 1918 July. Found guilty and sentenced to 'twenty months in the second division'. 1925 July 12th. Lawson died at his home, 25 Roxborough Avenue, Harrow, Middlesex. Probate to Thomas Ebenezer Lawson, Medical Practitioner, and Elizabeth Anne Harris (wife of Charles Wilson Harris). Effects 99 pounds. One son, John Oxenham Lawson, who married Enid Dorothy Maxwell in 1926 . This page was last edited on 9 April 2018, at 08:27.